How Baha’i faith is a Cult? Baha’i Faith: There are secrets but these secrets are not known to the poor, innocent, newly converted Baha’is. Does the common baha’i know that the Baha’i Elections are fully controlled by the “All Male, Supreme, All Infallibale, Haifan Organization”? Do they know that these are not spiritual but highly fraud and controlled? there are many secrets and are available on the internet. Search on google for “Pakistan Baha’i Election Fraud”, “Baha’i Control on their Electoral System”, “Baha’i Election fraud in India”. 2. How funding is obtained. Dangerous Cults: Commercial operations and/or mandatory donations (often large percentages) by members. Baha’i Faith: Has commercial businesses, businesses associations, huge property investments, heavy bank deposits. They collect money from poor Africans, Indians, Burmese, Nepalis, Pakistanis in the name of Community Banking and then use these funds for proselytizing. Also auctions are held of different used Clothings of Baha’i Leaders for fund raising. If they know about you have money, they (Especially Iranian Baha’is) will start motivating you to give the HUQUQULLAH, which is then transferred to UHJ in Haifa and it is then used to maintain Huge Gardens on Mount Carmel. Ask the Baha’is what they have done for the destitute of Congo and Sudan? Some of the fund is used for Pioneering purpose and it is allocated by the Counselors to its own people, sometimes exceeding 15000 US$ a year. There are huge financial scams in the Baha’i community. Just google to learn more, Search for Baha’i financial scams in Dubai, India, Italy, Pakistan, Africa, Iran etc. Recently a Saree (cultural dress worn by women in India) of Ruhiyyih Maxwell was auctioned to raise funds for Baha’i activities. 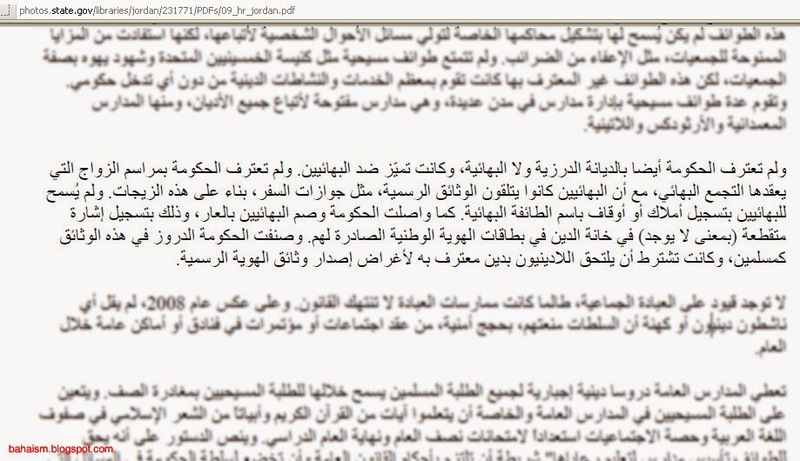 Translation : The minister in front of the House of Representatives on Wednesday (02-07-2014) declared that his government has rejected the Baha’i appeal to grant their cult a Non-Muslim, minority “Religion Status” in Jordan. About other 11 christian sects he has removed 2 sects from the list and did not gave his decision about the remaining 9 christian sects. 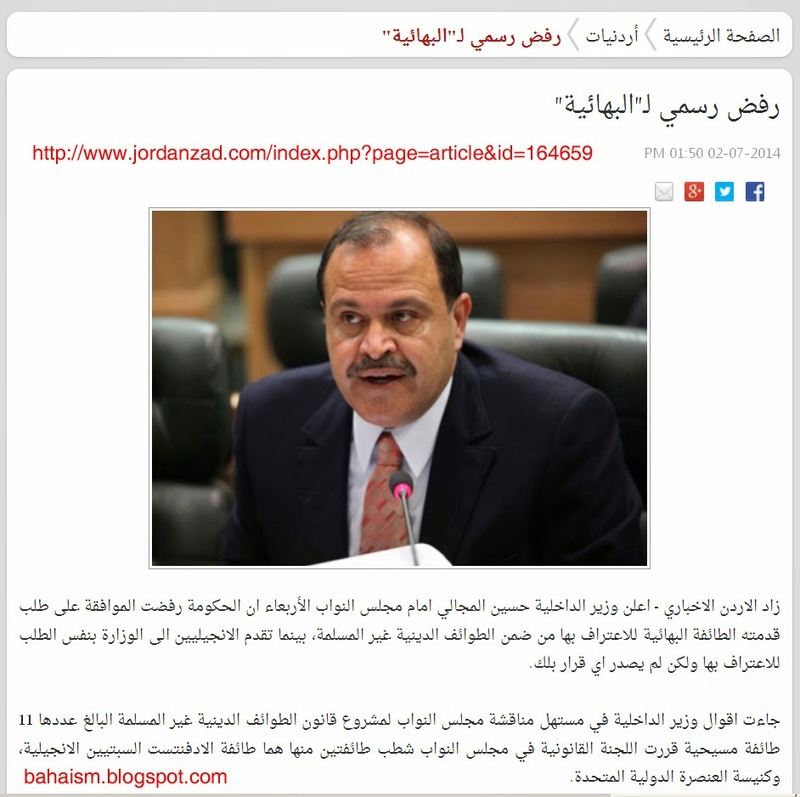 Interior Minister Mr. Husain Al-Majali refused to recognize the Baha’i cult in Jordan. United States is again worried. See the condemnation of United States in its so called “Human Rights” report of this country. US is interested in having the Baha’i nets everywhere in the Muslim world. After gaining success in Indonesia, they are now behind Jordan and pressurizing the Jordanian Government to recognize this cult as a Religion. If you are interested in the translation of the above text. Please help yourself with google translate. Thank you. 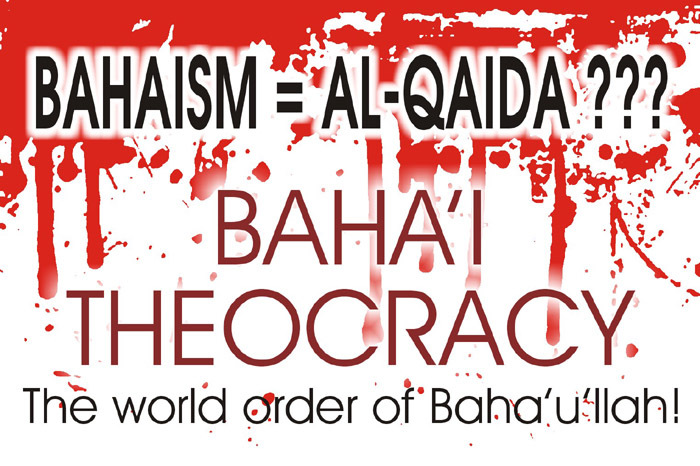 Following are the two links where Baha’is are teaching the Arab Muslims about the Holy Quran and Islam !!!!! They say, this way they are building a better society and establishing unity!! I say do this in Israel. Teach Zionist Israelis about Baha’u’llah and your universal peace! This article demonstrates part of the documents and reports acquired from SAVAK concerning the Bahá’is’ collaboration with the regime. The original documents are respectively provided at the end of this section. 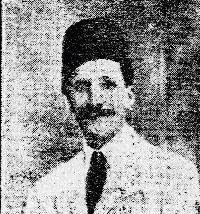 The major part of the organizations of the Shah’s damned rule, particularly SAVAK, was managed by Bahá’is. “John Ricardo I. “Juan” Cole (born October 1952) is an American scholar, public intellectual, and historian of the modern Middle East and South Asia. He is Richard P. Mitchell Collegiate Professor of History at the University of Michigan. As a commentator on Middle Eastern affairs, he has appeared in print and on television, and testified before the United States Senate. Unfortunately, a weird Baha’i sub-cult has arisen. It structurally resembles al-Qaeda, and differs from al-Qaeda only with regard to methods, not ideals. It does not usually employ violence or terrorism (though persons with this mindset have beaten up friends of mind). Bahaullah and his relatives instigated people against the government of Tabriz and tried to overthrow their government and lay the foundation of the new government and since Naseeruddeen Shah was busy in the activities of his government, they opposed him and ultimately he had to submit to their wishes with the condition that they would only preach their religion. They ate and lived lavishly under the pretext of teaching universal religion and peace. Wherever they could find anybody who was ready to listen to them, they used to preach against Iran. They killed a lot of children and women for to achieve their purpose. They even tried to kill me (Aawareh) but since I was careful they could not harm me. They instigated the people against me. Mohammed Kashani was a good man and I had helped him to get the post of teacher in a madresa. In one of the meeting in Tehran, they said to him that it was easy to kill Aawarah due to which doctor Yunus Khan was angry and thought resigning Some men pointed out that they have even incited women to kill me (Aawareh). Infact, due to this I feared that I should not say whatever I know and hence whatever I am saying now is very little of what is in my knowledge. Professor E. G. Browne wrote a book about the Bahais known as “Materials for the Study of Babi Religion.” On page 7 of this book, he writes, “Bahaullah migrated from Baghdad to Sulaymania Kurdistan with his servant Abul Qasim in the year 1271 AH. His servant died on the way. He said that I have heard from Abbas Afandi that Abul Qasim was Hamdani and he went from Sulaymania to Hamdan as per the wish of Bahaullah. After having sold all his property in Hamdan, he was returning to Sulaymania and since Bahaullah knew that Abul Qasim had cash with him, he killed him”. One of my friends received this email and sent it to me. It outlines the grief of a father whose is observing what is happening to women in the name of service to the UHJ. Do read it completely. I urge Bahais to circulate this letter and also non-Bahais who are well wishers of Bahais to make this letter as popular as possible. This is a letter from a troubled father to all Friends in the Community. Hopefully this letter will bring to light certain concerns about the Conduct of our beloved UHJ. Of course facts would be presented before drawing conclusions.